unique talents were and could then develop them. It is my experience that playing like power animals can truly help your child(ren) discover and attain their full potential in all areas of life--mental, physical, emotional, spiritual. How would you like to give your child(ren) the most precious gift imaginable? A gift that would keep giving and giving to them their entire lifetime! A gift of physical health! A gift of mental health! A gift of emotional health! Imagine what your child might accomplish with these gifts as a foundation for their life. The great sage, Dennis the Menace, said: "The best thing you can do is to get very good at being you!" Every child has unique talents. Your child has unique talents. Imagine what a gift it would be if every child knew what their unique talents were and could then develop them. Would you love to give your child this gift too? Dennis the Menace might say, "The best thing you can do for your child is to help them get very good at being THEM-WHATEVER that is!" And Mark Twain said, "Inherently, each one of us has the substance within to achieve whatever our goals and dreams define. What is missing from each of us is the training, education, knowledge, and insight to utilize what we already have." You can gift your children with a significant portion of this training, education, knowledge, and insight very easily by showing them how to imitate eagles, bears, dragons, gorillas, tigers, deer, and monkeys through t'ai chi and yogic movements and positions. Imitating animals was the first form of qigong ever created--long before t'ai chi or yoga. Imitating animals is a safe, fun, and effective way for children to maintain excellent physical and mental health that they will carry into adulthood and help them master whatever else they love to do, now and in the future. They will get better at whatever they love-computers, athletics, art, singing, dancing, playing musical instruments, science, inventing, investigating, and even studying. A third grader said, "T'ai chi cleanses my body and helps me with my work." Studies show that children practicing various t'ai chi and yoga programs do better in school and become more proficient in basic learning skills. A third grade teacher in America said, "I feel the deep breathing, flexibility, balance and coordination they experienced while doing t'ai chi increased their physical and mental well-being, and enhanced their learning! They came back to class positive, confident and focused." A 5th grade student, failing math for his inability to focus, said, "Well, I do just what you said when I don't remember the answer to the math test. I sit very still, focus on the energy ball in my abdomen, take 5 breaths, and then I know the answer." As your children master the various movements and poses of their favorite animal, they are gaining an unshakeable sense of confidence and accomplishment. These are profound gifts they can carry into the world one day as they too become parents, doctors, singers, business professionals, adventurers, farmers, police, clowns, pilots, astronauts, or whatever else they choose. While having fun pretending to be their favorite animal, your children are naturally and easily developing their minds and bodies, learning social and behavioral skills, connecting their inner world with the outer world, and absorbing values and habits that will serve them throughout their life. Imitating and moving like animals in these special yogic and t'ai chi ways can help your children discover and develop their own unique imagination and creative abilities. Albert Einstein said, "Imagination is everything- more important than knowledge.It is the preview of life's coming attractions." Imagination, attention span, power of concentration, and memory will become stronger and stronger as your child increases and stabilizes their own internal energy or chi. Frolicking like animals helps integrate the mind and body, balance the left and right sides of the brain, increasing your child's capacity to handle stress. Kids are the embodiment of change, and change can be very stressful. The proven stress relieving qualities of frolicking like animals creates a wonderful sanctuary amidst the hectic schedules of play dates, school, and extra-curricular activities, as well as the many fearful encounters children face. Zac, a 5th grader, says "I enjoy tai chi. It is relaxing and fun." Frolicking helps kids become calmer and more aware of what's going on inside them. Kids learn to listen to the messages their bodies are sending them. A third grader says, "T'ai chi relaxes and stretches both sides of the body. It makes your body nice and calm." Playing and pretending to be a powerful animal builds self confidence and teaches your child(ren) that real strength comes from an awareness of themselves and their surroundings. Children are inundated with images of aggression-television, movies, wrestling, news, video games, cartoons and so much more. Instead of teaching your children how to fight, animal frolicking shows them how to be in control of their body and mind, stay away from harmful situations, and how not to get hurt by giving way. Children learn that they can flow around obstacles like water in a stream and still be as powerful as a mighty flood. That they can experience the relaxation of a cat while remaining alert and capable of super fast reactions. Pretending to be an eagle, deer, tiger, monkey, gorilla, dragon, and bear instills real values of inner peace versus hurry and worry, assertiveness versus aggression, humility versus arrogance, and playfulness versus perfection. The calmness, concentration, and focus arising from animal frolicking also makes this unique program a wonderful adjunct therapy for treating Attention Deficit Disorder. Medical doctors Edward Hallowell and John Ratey, experts on the management of ADD wrote, "Exercise is positively one of the best treatments for ADD. It helps work off excess energy and aggression in a positive way, it allows for noise-reduction within the mind, it stimulates the hormonal and neurochemical systems in a most therapeutic way, and it soothes and calms the body." Animal playing like these special t'ai chi and yoga animals helps your children harness and focus their vibrant but often scattered energies. Second grader Abbey agrees when she says, "T'ai chi quietly calms my body down." And 9-year-old Rebekah confirmed this too saying she felt only "calm and relaxed" after frolicking like animals. Albert Einstein also said, "The most beautiful thing we can experience is the mysterious. It is the source of all true art and all science." 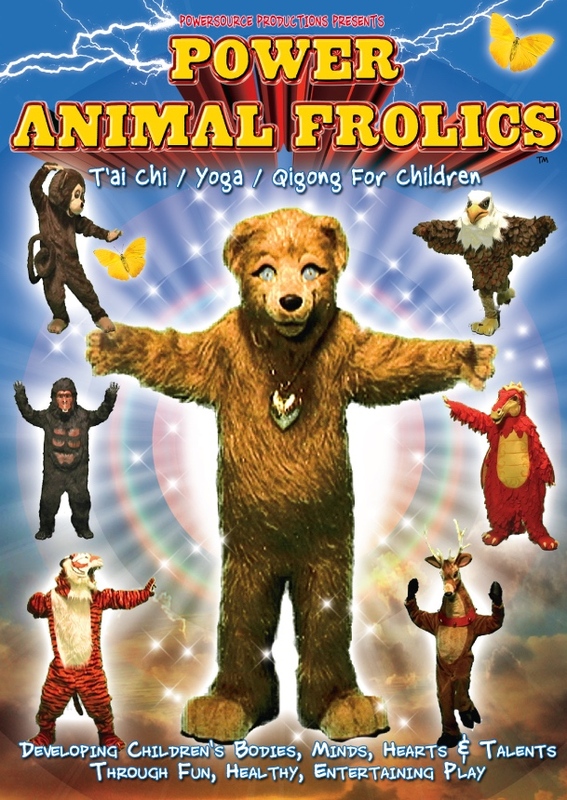 It is my experience that animal frolicking holds many mysterious and incredible gifts for you and your children to discover and unwrap for years to come. In addition to some of the benefits set forth above, animal frolicking can generate feelings like the thousands of tiny bubbles that arise when a bottle of champagne or 7 up is popped open are bursting in every cell of the body. Remember what those fizzling bubbles feel like when they're sliding down your throat? Now, imagine that feeling going on and on, nonstop, in every cell of your body simultaneously. Sometimes, those feelings may get much stronger--like you're a rocket ship on a launch pad in those moments between ignition and lift off. Moving like a t'ai chi or yoga animal can also leave your mind almost completely free of unproductive thoughts too. Free to savor the remarkable feelings pulsating in your body. Free to experience yourself as one with others, nature, and the Source of all Life. Some of these benefits can be experienced right away. And, with many years of practice, they become our normal, everyday, waking experience. But, just like the most luscious dessert, you can only savor and relish the unlimited treasures of frolicking like a magnificent animal by digging in. Frolicking will naturally nurture a child's body, mind, and spirit like sunshine, soil, and water magically nurture a rose bud. They make people glow from the inside, generating a smile that arises from a heart full of gratitude and compassion. Frolicking helps people of all ages stay physically healthy and mentally happy. Fear, pain, anger, addictions, anxiety, depression, procrastination, and greed run away from people who do animal frolicking. A consistent practice of playing like these special t'ai chi and yoga animals can help your children, you, and your entire family feel better than you ever imagined possible. Galileo said, "You cannot teach people anything. You can only help them discover it within themselves." Gifting your child(ren) with the time and skills to play at t'ai chi and yoga like a powerful and graceful animal can truly help them discover and attain their full potential in all areas of life. Originally shared at my EZine Article.